I think that zucchini, ricotta, and mint is the ultimate springtime and summer combination, and I love that the same ingredients can be presented multiple ways for different looks. If you like what you see, you’re going to have to head over to Everyday Maven to get the recipe 🙂 Once you’ve done that, I want you to come back here and link up your favorite mint recipes! I’ve got a big ‘ol bunch and can’t wait for some great ideas on how to use it. I’m excited for all the sweet, savory, and beverage recipes that you’ll share. Have a great weekend! 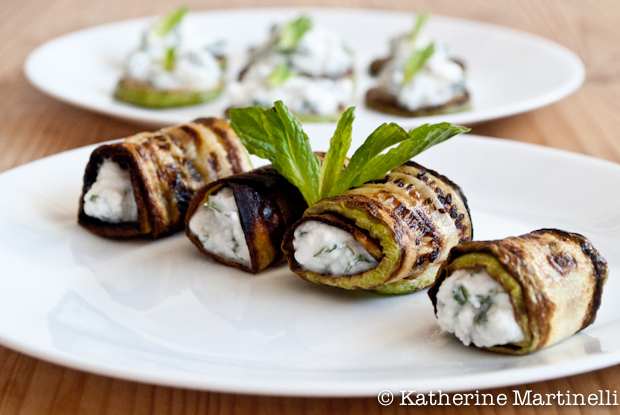 Love both of your zucchini apps and I know I’ll be trying them this summer! I especially like the zucchini cut into rounds, since it looks like a cracker-based appetizer, but with no carbs. Sounds like an excellent combination and a wonderful party finger food. Mint is such a great choice for this week, and I love your zucchini appetizers- gluten free, low carb who could ask for more. Can’t wait to try them for dinner tonight! YUM!!! I’m so glad the mint is flourishing in my garden! love the Friday blog hops, should have joined a long time ago. Not sure how to add a description (grapefruit and mint sorbet) to my pic. love how light and refreshing this is, definitely perfect for summer! Ahhh, I love mint! I shared an oldie but goodie, one I still like to make even several years later. What a gorgeous and light recipe! I love rolls and other cute, snack-sized dishes (even served as main course) so I will remember your courgette “trick”. I have always used aubergine this way. Thanks for this wonderful idea! Love your mint blog hop! Our mint is going crazy and I can’t wait to try your recipe with zucchini, mint and ricotta. Definitely a taste of summer! Your photo is so tempting – I’d like to pluck one off the plate to enjoy right now. Pingback: Happy St. Patricks Day Green Smoothie – have a Shamrock Shake the healthy way! Saw your guest post and it was amazing. Great job and great pics! Never know how to use mint! This hop will be a precious source of info! Great recipe. I love things that use mint. It grows everywhere and I love the taste. I love zucchini and ricotta together. Try it with fennel seed sometime, too. It’s excellent. These all look delicious! I just bought a pot of mint but I don’t have a mint recipe posted so I couldn’t join! I’m going to check out your recipe now. I’m so excited this is something I really want to make! I just had THE best herbed ricotta out at lunch with friends two weeks ago, and now I’m addicted to it! They served it with a fig compute and grilled bread, and I thought I was going to explode from all the bread I ate. I love the idea of wrapping it in grilled zucchini! Great guest post, Katherine! 🙂 I haven’t had herbed ricotta yet but that has to change immediately! I’ve got tons of mint in my garden at the moment, so I’m up for anything with mint in it (and before long I’ll have tons of zucchini, too!). Good recipe – thanks.